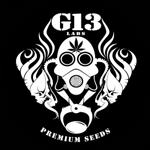 The history of G13 Labs stretches back into the late 1980\'s in the north of the United Kingdom. The original agent set up an underground collective which made their way to Amsterdam and formed connections with various other highly experienced agents. G13 Labs are working with a selected number of experienced agents which are operating all over the world. They have a highly proven record and they have already established their own cannabis seeds strains. Prepare for concentrated experience and quality!